On August 11, 2016, Marketing EDGE announced the winners of the 2015-16 Marketing EDGE Collegiate ECHO Challenge. I am pleased to report that the team of Dorothy Capasso (Team Leader), Allie Hammond, Joseph Scully, Mitchell Meyers, and Mariam Bekele captured the 3rd Place Bronze Award in the undergraduate division. The team developed an integrated marketing communications plan for Facebook Custom Audiences. Learn more about this team and their exciting experience in this year’s competition. 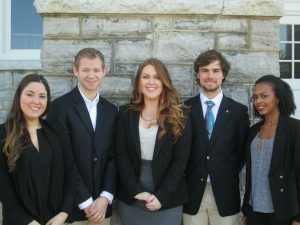 Dorothy Capasso (Team Leader), Mitchell Meyers, Allie Hammond, Joseph Scully, and Mariam Bekele – 3rd Place Bronze Winners in the Undergraduate Division of the 2015-16 Marketing EDGE Collegiate ECHO Challenge. 2 Comments on "JMU Wins Bronze in 2015-16 Collegiate ECHO"